The 2017 & 2018 Expo have provided a foundation and safe place for like minded souls to come together. 2019 will be the start of every truth seekers dream. The Awakening returns on Friday 19th & Saturday 20th July 2019 for our most impressive speaker line up yet. 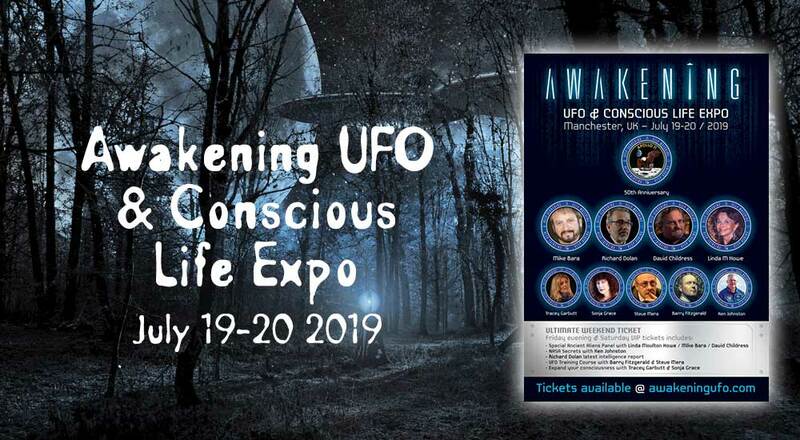 Join our Ancient Aliens panel Linda Moulton Howe, Mike Bara & first time appearance at the awakening expo David Hatcher Childress, we will explore all the evidence left behind on our planet. They will also be providing unique presentations of their own over the weekend. Leading ufologist Richard Dolan will go deep down into the rabbit hole. Steve Mera & Barry Fitzgerald will present a unique UFO course. NASA whistleblower Ken Johnston will tell all nasa wants to keep hidden. Tracey Garbutt will take you to other worlds with her remote viewing experiences & Sonja Grace will share her stories of her time travelling. This will be Europes biggest push on disclosure like never before. Help us get to the truth in 2019. We will have an incredible area for healers, spiritual readers, exhibit stalls & prop builds during the Saturday event. It’s time to Awaken & explore the truths about our place in this mysterious world. Join us in Manchester for an interstellar journey into the unknown with the worlds leading truth seekers. Almost every edition of our World Explorer Magazine is available at our online Bookstore. Pick up a copy today! Become a WEX Club member and receive a regular subscription to WORLD EXPLORER MAGAZINE. After more than 20 years of investigating arcane subjects, David Hatcher Childress finds his unique views and ideas are gaining popularity. He has appeared on various TV specials, and for the Discovery Channel, A&E, and the History Channel. He is also a frequent guest on nationally syndicated radio shows. He continues to explore, write and excite people about discovery through his magazine, World Explorer, and his publishing company, Adventures Unlimited Press. Visit Adventures Unlimited Press for a Free Catalog! WEX members can place an ad in our World Explorer magazine classified ad section—up to 25 words are free. Non-Members need to pay 35¢ a word. Copyright © 2016 Wonderwave Design. All Rights Reserved.